In the history of Christianity, there has never been a century or so where there has not been some kind of theological controversy. In any given controversy it is usually the case that there is a spectrum of positions that occupy some place on the argumentative field. Caution is therefore required in data selection to establish points about who taught what and how widespread a given view in fact was. Such is the case with the Iconoclastic controversy. Iconoclasm came in a variety of forms and varied over time. Initially iconoclasm in the East identified images of persons and biblical figures as idols while preserving the use of decorative images such as the Cross. Representational (though not necessarily figurative) images of Christ and images of the saints were prohibited. Due to their material composition they could not convey the resurrected glory of the saints. Such was the position around the 750’s. By the early ninth century in the East iconoclasm became more moderate even under the favorable impetus of imperial backing. Gone were the arguments by and large that icons were equivalent to idols, along with the Christological arguments that to make an image of Christ implied a major Christological error. The situation in the West was different for a variety of reasons. The West was a hodgepodge of various kingdoms, with certain parts of the old empire still under the control or influence of Constantinople. The most salient party is that of the Franks, who had forged an alliance with Rome. Politically this had its advantages but also presented problems. With an alliance with the Franks, Rome was far more free and autonomous than under imperial rule. The Franks gained the political and religious legitimacy that they so eagerly coveted. But no marriage is perfect. On the one hand, the Franks and Rome were at odds over images by the middle of the 8th century as well as over the Filioque’s inclusion into the Creed. Second, a period of possible alliance forging between the Franks and Constantinople put Rome in a pickle. If this were to occur, Rome would come under someone’s imperial thumb, Frankish or Constantinoplian. But Rome was opposed to the iconoclasm of the Franks, as well as the Filioque’s inclusion, while wishing to lend legitimacy to the Franks for the military protection they provided. Rome was also opposed to the iconoclasm of the eastern iconocalsts. Such was the situation. Frankish iconoclasm was also something of a mix over time. In 731, a Roman synod approved not only the making of images, but also their veneration. 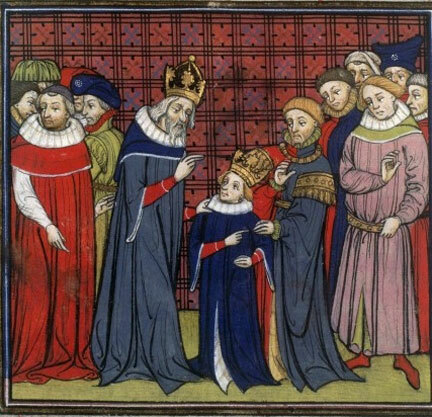 King Pepin held a sort of convocation or synod with attending debates in 767 at Gentilly. On the agenda were images and the Filioque, though it is doubtful that the Easterners or the Franks put the latter on the agenda given their attempts to forge an alliance at this time. It is quite likely that the Pope did though. By 769 Rome held another synod in which over a dozen Frankish bishops participated which essentially re-affirmed Rome’s iconophile position. By the time of the council of Frankfurt in 794 the Franks came to a moderate iconoclast position, shifting from their earlier position at Gentilly-images were not to be venerated or rejected. Frankfurt of course rejected 2nd Nicea as having ecumenical weight, not the least reason was that the Franks weren’t invited to the party. Of course, the Franks worked with a faulty translation of 2nd Nicea. And even their best theologians who dealt with it made rather basic mistakes in terms of attributing who said what and being in the dark about what a good many Eastern Fathers had said on the subject of images. The Franks also lacked a fixed terminology with respect to worship, honor, veneration and such, making the problem more difficult. While conceptually they seem to have been able to recognize the distinction between veneration and worship, at this period they rejected it, in part because of semantic slide in the Latin terms they used but also because of some of te philosophical principles undergirding their theology with respect to the natural of the spiritual. 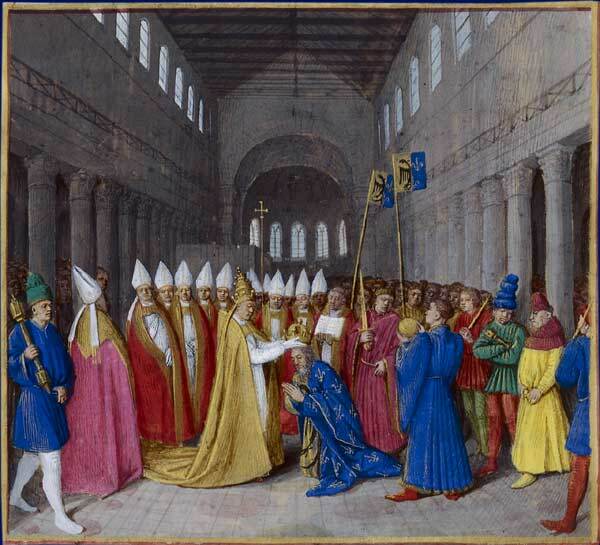 The Franks composed a work to counter the decisions of 2nd Nicea usually referred to as the Libri Carolini, The Caroline Books, but more precisely The Work of Charles Against the Synod. While it is clear from the manuscripts that Charles Magnus had a direct hand in its composition, it isn’t singly his work, but a collaborative effort. There are a number of important things to notice in this work apart from the usual iconoclast argumentation. The work never directly challenges the Popes or their rulings or the synods held by the popes (and participated in by the Franks.) The charge is always made in a roundabout way. While the Franks rejected 2nd Nicea as ecumenical in this work, they did not do so openly in the presence of the papal legates at Frankfurt. And the decisions that were reached were often headed by Charles taking the lead. Canon four of Frankfurt is a prime example stating “Our most pious lord king decreed…” In the Libri Carolini, no name appears as often as that of King David, to whom Charles is compared on a regular basis. This is significant since a widely applied title to the emperor in Constantinople was that of “second David.” But Frankfurt wasn’t content to reject the ecumenical standing of Nicea, but also denied it to the iconoclast synod of Hiereia as well. Both the Libri Carolini and Frankfurt aren’t just about theology, but politics. 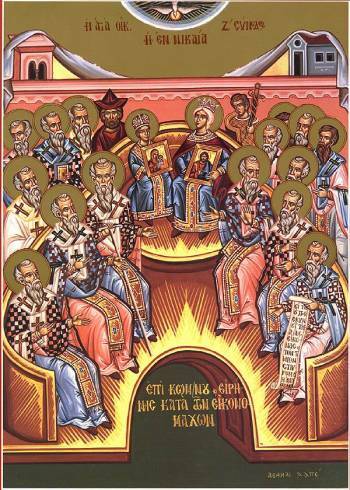 “If the bishops of two or three provinces come together, armed with the body of teaching found in the ancient canons, and establish some point of teaching or dogma which does not diverge from the doctrine of the ancient Fathers, then the point they establish is catholic and can indeed be called universal, for although it was not established by the bishops of the universal world, nevertheless it does not diverge from the universal faith and tradition. We know that this has frequently happened in many parts of the world, as circumstances have required, for many councils have been held through whose actions the holy Church is both defended and strengthened.” Opus Caroli, 4.28. Of course, what this leaves out is the fact that when minor synods did so, they only achieved said status as a result of confirmation by the major sees in wider councils and such was not the case and not likely to be the case for Frankfurt. Given the position of Pope Hadrian and Patriarch Tarsius, the Franks had to know that this was so. In any case, the argument was to support the main theme of the Libri Carolini, that the Franks maintain the tradition of the Fathers and the Easterners don’t. By the early 9th century things had begun to shift. As noted above, the resurgence of iconoclasm in the East was in principle more moderate. Over time, the Frankish position shifted also to an even more moderate position, coming into line with Rome and 2nd Nicea with the convenient forgetting of the previous rhetoric aimed at the latter. This is evidenced in the 820’s. 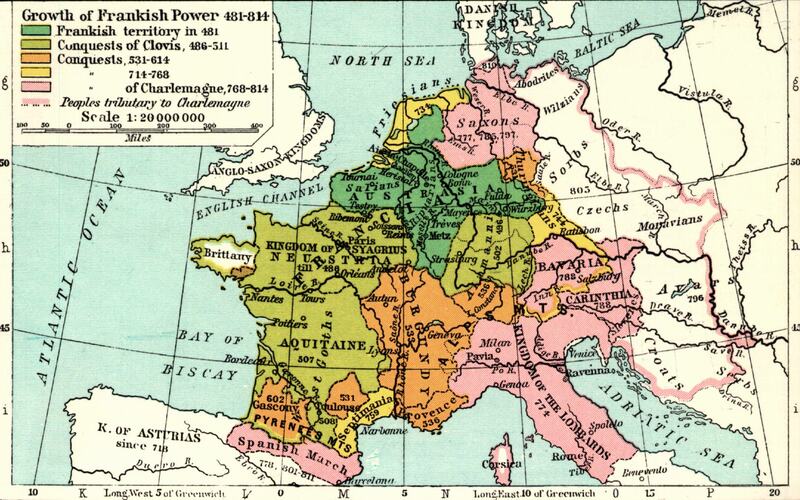 In 825 a colloquy was held at Paris under king Louis the Pious. A number of issues were on the table: images, the Filioque and Christological adoptionism. This meeting is never in any source known to use the desgination of “council.” There is good reason for this since the Franks didn’t dare directly challenge the Popes theologically because they depended on Rome for their religious standing. A fair amount of material from the Libellus produced by the meeting defends the making of images but condemns adoring them if adoration is taken in an absolute sense. They distinguish between adoration rendered to God alone and a broader application of the term they reject for images, with some exceptions. The Cross is unique and rightly venerated. Hence, the Frankish opposition to icons in the west varied over time and was more moderate even at its height than say the later iconoclasm of John Knox. Nor was it motivated purely by theological concerns as the Franks had much to gain by de-legitimizing their political adversaries in the East. This serves to explain why they rejected both 2nd Nicea and Hiereia, not only in terms of being ecumenical, but theologically as well. Other considerations should be kept in mind. Even the best Frankish theologians in the main could not read Greek. Their knowledge of patristic writings, as well as philosophical works was much more limited than their counterparts in the East. Now we come to a relevant figure, that of Claudius of Turin. Claudius is put forward at times by Protestant apologists to show that there was opposition to 2nd Nicea, even in the West. To see if this is so, we need to place Claudius in his Frankish context. Claudius is bishop of Turin sometime around 816 or so. His origins are obscure but there are some pieces of information that can be brought together. He was a Goth and seems to have spent some time at Lyon. While he received a very limited formal education he eventually caught the eye of Louis the Pious who appointed him bishop. His familiarity with the fathers is limited but he shows a particular awareness of Augustine. 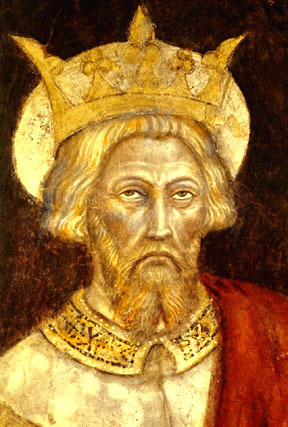 Claudius wrote more or less drafts of a long series of biblical commentaries which might have been what moved king Louis to appoint him bishop. Probably around 817/18 Claudius engages upon an image destroying venture. How far he went though isn’t quite clear. He removes and destroys images and statues in “all the basilicas” which he saw were “filled” with such things. This incidentally testifies to the widespread use of images even among the Franks. There is some evidence that he didn’t leave their spaces vacant but filled them with new works of religious art but that was more figurative or symbolic with various geometrical figures rather than the representational works that occupied those spaces previously. But he goes further than any other Frank, rejecting veneration of the cross, pilgrimages and possibly the veneration of relics. Eventually he composes an Apology (after 824) which through extracts gives us a window into his thought. The Apology contains the usual earlier iconoclastic arguments, though seemingly lacking the more sophisticated Christological lines of thought. There is the usual ldeployment of the 2nd Commandment as forbiding images and their worship and then this is extended to include veneration. Claudius doesn’t accept any distinctions between veneration and worship or invocation and worship. They are all mutually entailing concepts. Consequently, material things or even matter itself cannot mediate worship or honor given to God (or anyone else). To be “spiritual” means to be immaterial for Claudius. At this point Claudius is at odds with Augustine’s teaching on the mediating role of signs and symbols. It is no surprise to see Claudius in the Apology emphasizing the divinity of the post Resurrection Christ at practically the expense of his humanity. Sometime around 824 he was summed to a synod, but he refused to appear designating the synod a “collection of asses.” It is not clear whether this was the Paris Colloquy of 825 or not. Nothing directly in the Colloquy’s documents addresses Claudius, but the accusatory tone seems to fit with someone like Claudius. There is then apparently a significant delay between the initiation of his iconoclastic venture and the disciplinary steps taken against him. It seems that the court of Louis the Pious was not aware of his activities for quite some time. But when Louis does become aware, he commissions Jonas of Orleans and Dungal to refute Claudius’ Apology. Dungal was the master of the school at Pavia, significant since it was the capitol of the kingdom. Jonas begins his work On the Cult of Images but stops around 827 since Claudius has died. Jonas gives a good many of the usual iconodule responses to Claudius. He distinguishes between veneration and adoration, though he is still not always consistent in his usage. Nonetheless, he argues that veneration in the form of kissing is permissible. A few interesting bits from Jonas’ work deserve attention. Jonas complains that among Claudius’ followers that the Arian heresy has been revived. This is significant given the species of Adoptionism that the Franks in collaboration with Rome had been combating from Spain. Jonas consequently links Claudius with the Spanish Adoptionist Felix of Urgel as the latter’s pupil. Jonas argues that the whole church is against Claudius’ in light of Claudius’ claim not to be a sectarian. Jonas isn’t without his own problems though. In countering Claudius’ rhetorical flare that God commanded one thing and those who venerate images did something else, Jonas says that it is natural to the human condition to do otherwise than the divine command, namely to sin. This is ambiguous at best and a serious error that will hound western theology for centuries to come. Dungal of Pavia’s life is far less clear. It is likely that he hailed from Ireland but of this we cannot be certain. His Responses contra Claudium contain some interesting material. He accuses Claudius’s position of entailing the heretical doctrines of Eunomius. If God is simple, completely alien and opposed to the material world in the way that Claudius seems to think, then he has embraced the false doctrine of God held by Eunomius. God and matter aren’t related as two ends of a spectrum as Claudius seems to think. Dungal argues that he does not adore painted images of saints, but rather venerates “in God those whose likeness or bodies they are, asking their intercession that divine help be made present to us.” (C. 46-47) For Dungal, images are vey much akin to relics or other sacred objects used in worship. “We also adore and cherish God’s good and holy creation, that is we humbly honor, love and embrace a holy angel, or a holy man, or the holy cross, according to their varying degrees of worthiness, and we do so on account of God, and in God, and not at all as we adore and cherish Him.” (C. 84) To buttress the point, he proffers Jerome’s distinction of adorare for worship exclusively for God and honor for other agents. So strong is Dungal’s inconodulism that he takes images to be invested with a kind of metaphysical holiness, thereby coming into line, albeit indirectly, with the theology of John of Damascus and Theodore the Studite. Here Dungal has reached the theological high point of iconodulism among the Franks, though he doesn’t seem to clearly cash out the metaphysics of the sanctity of images. To continue to contextualize Claudius there are other figures that require our attention. Agobard of Lyons (769-840) was a Goth and made an archbishop around 816. He was involved in a number of controversies of the time, theological and political, which placed him in opposition to king Louis-this eventually got him deposed. He wrote a small treatise, On Pictures and Images where he advances a more moderate iconoclasm than that of Claudius. He argues that it is illegitimate to make an image of God as well as venerate it, (a point that any iconodule would likely agree with). He relies in the main on Augustine’s City of God to cash out how terms used for worship are to be understood. He divvies up the terms with honorare for saints and relics, and adorare, colere, and veneare for God alone. Sacrifices and worship belong to God alone and are not to be paid to saints. But following Jerome, veneration is legitimately paid to the relics of the saints. Whoever receives the saints, receives Him who sent them and so the honor paid to the saints bears a transitive relation to Christ. Memorials relative to the saints are not made to pass along worship, but they are not idolatrous either. He further parts company with Claudius in permitting veneration of the cross. He argues that images of Christ and the apostles are of “ancient” standing, that is apostolic, and so permissible, though he precludes their veneration. He employs material from the Venerable Bede’s work, On the Temple to support the claim that there is no absolute prohibition on images since God commanded them to be made in the Temple. Image making in the New Covenant is expanded, though for Agobard veneration is still seems precluded. He goes so far via Augustine to argue that even the pagans doubted that that images were necessary to worship their gods. True worship is afforded to the spiritual, that is, the immaterial for Agobard. “Nothing material is holy, participates in holiness, communicates holiness.” ( Noble, 320) Lastly, Agobard is still within the moderate iconoclasm since he refuses to call for the destruction of images, even though he is the only Frankish author to refer to the synod of Elvira. Walahfrid Strabo (b. 808) became the tutor for Louis youngest son Charles. He devotes no single work to the image controversy but in a larger work, which is something of a history of worship, he devotes his eighth chapter to pictures and images. Images are not to be worshipped but neither are they to be destroyed. Images beautify the church and serve as memorials for the saints to commemorate them or to signify some great act. Hence images may be placed just about anywhere. Since God commanded images to be made in the temple and elsewhere, they cannot be absolutely prohibited in the New Covenant. If images mislead the simple, this is no reason to prohibit them or the “moderate honors” given to them, unless one wishes to object to God creating physical objects in the first place. Walafrid is no friend to Claudius since the latter was “pierced through by the shafts of diverse opponents.” He even deploys the older iconophile argument that to show dishonor an image of the emperor is to show dishonor to the emperor himself. If the simple are misled by images into giving them an immoderate degree of honor, then we should he argues, abolish churches since God is not confined in any space. That would eliminate the errors of the simple, but it would also preclude all other forms of devotion as well. On the other hand, Walahfrid complains that the foolish bow to images, which leaves it unclear exactly what kind of “honors” he thought were permissible to images. There are other examples from the Franks that could be brought forward (Hrabanus Maurus 810/814 or Freculf of Lisieux 829 for example) but they all more or less follow the Frankish via media of neither destroying images nor allowing veneration or only minor forms of it. As one moves from the eighth to the mid ninth century, veneration of images, like relics is permissible, although within certain prescribed limits. Consequently, it is now possible to see the value of Claudius of Turin in this context. Claudius simply can’t represent western opposition to 2nd Nicea because he isn’t representative in any of the ways that matter relative to Frankish opposition to 2nd Nicea. He is not in mainstream of Frankish opposition but along its fringes, so far along the fringes in fact that the Franks themselves reject his position. One swallow certainly doesn’t make a Spring. If anything Claudius is the exception that proves the rule, that image making, even if not iconic veneration, was far more widespread independently of the iconoclastic debates within the imperium than Protestant apologists often claim. Claudius’ protestations show that even among the Franks, despite their political and ecclesiastical opposition to the Eastern (and Roman) iconophilia, the boots on the ground situation was not only one of icon making, but iconic veneration. There might be many different reasons why iconic veneration was widespread, but Claudius seems to interact with the basic theological outlook of iconophiles, which seems to indicate that support for it wasn’t based on sheer ignorance of church teaching but a reasoned line of thinking and teaching. His opponents took themselves to be representing an established position. Moreover, Claudius is atypical because he rejects not only images, although not all forms of ecclesiastical art, but relics and their veneration, saintly intercession and seemingly, invocation. This puts him outside the mainstream of any Frankish opposition to 2nd Nicea. As far as the Franks are concerned, Claudius is a “renegade.” Another significant difference is that the Frankish opposition to 2nd Nicea in the Libiri Caroli is situated to serve a political end, just as their inclusion of the Filipoque was designed to do. Representative Frankish opposition to 2nd Nicea then fails to map onto the species of iconoclasm as represented by Claudius or John Calvin & John Knox. (This is one of the ironies of history, given that Calvin employed the Libiri Caroli for support against images, which while arguing against 2nd Nicea, also argued against his own position. Inst. 1.11.14. Though Calvin never seems to correct any of the mistaken attributions and bad translations in it.) From 767 onward to the middle of the 9th century, the Frankish shift in position maps on to the Lutheran or Anglican position, if it resembles any contemporary position. But back to Claudius. In point of fact, it doesn’t seem clear that Claudius is reacting to 2nd Nicea at all, but the local situation as he found it. So far as I can tell he doesn’t show any awareness of 2nd Nicea or that he is writing in opposition to it. So at best he could only be considered as an opponent of 2nd Nicea indirectly. If we are to find western opposition to 2nd Nicea, it will have to be among the theologians of the Frankish court. Claudius can amount to no evidence of western opposition 2nd Nicea. As to opposition to councils, any given council that rules on a theological matter will likely encounter opposition to its decrees, no matter how legitimate or correct such a council is. It doesn’t follow that the opposition, no matter how geographically widespread is correct or is, of itself, indicative of anything. This is a point Protestants should keep in mind, especially since the shoe is on the other foot. Their position was subject to widespread opposition, not only in the West, but in the East as well. If we were to describe the situation to Protestants without labeling the actors, I think their intuitions might get them to render a different judgment. If a handful of lower clergy and laymen, complaining about abuses, however legitimate their complaints in some cases may be, who take to themselves the right to reconstitute the church and formulate a theological system (I am assuming for the sake that there are no major splits such as between the Lutherans and the Reformed) that significantly departs from any of the previously established churches qua system and is condemned by said churches on every continent in which the church exists, what do you suppose they would think? I recall R.C. Sproul on one occasion remarking to the effect that if the entire church says you are wrong, then you probably are. Agobard of Lyon, Agobardi Lugenensis Opera Omnia, CCCM 52. Turnhout 1981. David F. Appleby, “Holy Relic and Holy Image: Saints Relics in the Western Controversy over Images in the Eighth and Ninth Centuries.” W & I 8 (1992): 333-343. Charles B. Ashanin, “Western Reaction to the Seventh Ecumenical Council.” Patristic and Byzantine Review 7 (1988): 59-66. Charles Barber, Image and Likeness: On the Limits of Representation in Byzantine Iconoclasm, Princeton Univ. Press, 2002. Courtney Booker, Past Convictions: The Penance of Louis the Pious and the Decline of the Carolingians, Philadelphia, 2009. Roger Osterhout & Leslie Brubaker, eds. Byzantium in the Ninth Century: Dead or Alive?, Aldershot, 1998. Celia Chazelle, The Crucified God in the Carolingian Era, Cambridge, 2001. Claudius of Turin, Defense and Reply to Abbot Theodimir, Trans. George E. McCracken, in Early Medieval Theology. London. 1957. Dungal, Reponses contra Claudium: A Controversy on Holy Images, Ed. Paolo Zanna. Per verba 17, Florence, 2002. Rosamond McKitterick, The Frankish Church and the Carolingian Reformers, 789-895, London, 1977. Thomas F.X. Noble, Images, Iconoclasm and the Carolingians, Univ. 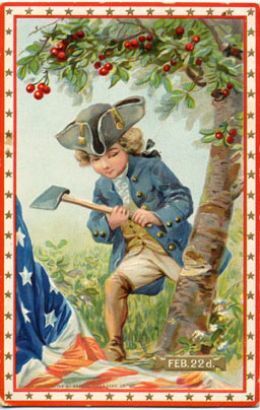 of Pennsylvania Press, 2009. Leonid Ouspensky, The Theology of the Icon, SVS Press, 1992. Walafrid Strabo’s Libellus de exordiis et incrementis quarundam in observationibus ecclesiasticis rerum: A Translation and Liturgical Commentary. Alice L. Harting-Correa, Leiden 1996. It’s interesting that the Irish always seem to have the positions closest to the East. They were aware of it, yes. Did they understand it? It appears not. I wasn’t looking to assign blame in my query. Rome was aware of 2nd Nicea and so were the Franks and not centuries after, as the material I presented above shows. As far away as Bede in England knew about it as well. Both. I blame the Iconoclastic emperors for the opening divisions more than either the Franks or the Papacy. The later Byzantines were dealing witha more or less “inherited” situation. I don’t think Photius saw himself as doing anything terribly monumental, certainly not with centuries-long ramifications. After all, he died in communion with Rome. From what I understand, the West was not fully aware of the Seventh Council until centuries after it happened, so there was a lot misunderstanding going around anyway, with nothing to blame but the fact that it was the Middle Ages and people often didn’t have immediate access to information that was reliable, or the available means to translate it. So, I try not to be too hard on either the Franks or the later Byzantines (or the Papacy). You are right that often that is the case and people over do it. What is required first is a definition of what would constitute the judgment of the whole church. Even on Protestant grounds if it meant what each and every layman and clergy believed at a given point, this would be impossible to fulfill with say subscription to their respective Confessions. This is why the conditions on what counts as a normative act of judgment by the church is important, for any position. This is a bit off topic, but I hope some find these remarks be me to be at least a little useful. While I disagree with the conclusions quite often (I am Lutheran), the whole system seems to be just a cloak for believing one’s own church is the Church. This can be seen in the arguments between EOs and RCs regarding various controversial issues between them. No one can really claim the “shoe” was consistently on the foot one would like all through history, so it would behoove apologists who lean on the “unity” argument to be a bit more cautious. But that’s the irony. Do the Franks count as the West or did Rome? I concluded after studying Byzantine history in college that the Iconoclastic Controversy contributed more to the East/West Schism than the (rather marginal) events of 1054 or even the atrocities committed by both sides leading up to and including the sack of Constantinople in 1204. Perry, I have been enjoying your blog (and Jnorm’s among others) immensely. You write with honesty, fact, and passion. This article shows the depth of your research. I wish I knew about this when I was Protestant. Thank you. Good stuff, perry. A friend of mine (and noted Reformed blogger (I won’t link to him because I don’t want it to pingback and he start filling my inbox with emails on how mean I am) used the Franks to “prove” Orthodoxy wrong last year. Might re-read his arguments in light of this post.